Anyone else absolutely in love with floral print right now? I cannot get enough! I love all of the different types of florals that are on trend, from big blooms to dainty flowers. 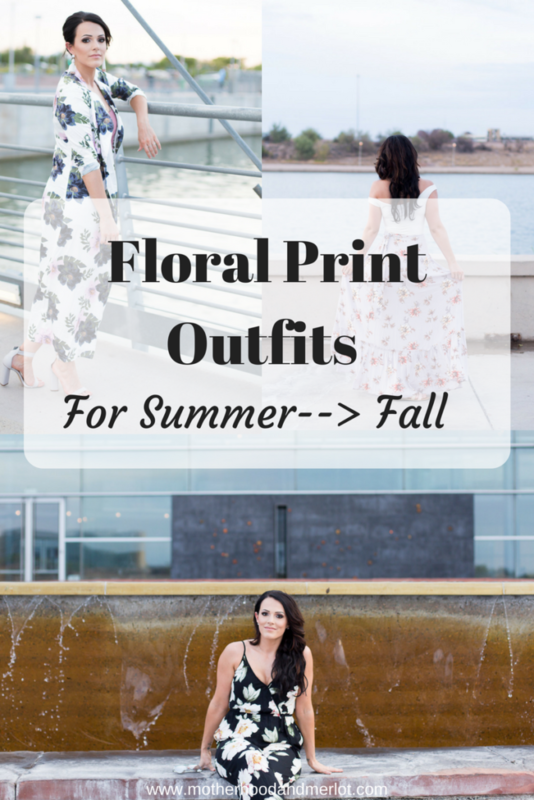 I have put together some of my favorite floral print outfits for this season. A few of them have great transitional pieces that can be worn from summer into fall. *Some links in this post are affiliate links. This means I would make a small percentage if you use those links to shop some fabulous looks for yourself! Thank you for your continued support of Motherhood and Merlot. 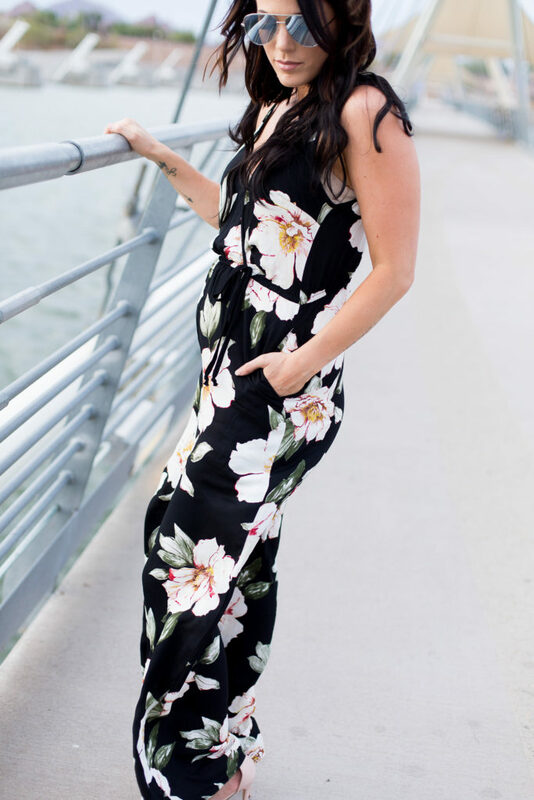 Jumpsuits are a staple in my closet because they are a complete outfit in one! All you need to do is throw on the right heels (or flats) and you are out the door. This floral print is gorgeous, and you could pair it with a jean jacket or blazer to transition into fall. Plus, it is beyond comfortable! This had to make it into the floral print outfits round up. How gorgeous is this skirt? It is originally from T. Madison shop, but I have also linked similar options below. I love it for a late summer piece. Again, add a cropped denim jacket to this to make it absolutely perfect for the cooler weather. This last outfit is a must-have for fall. I live for body con dresses, because they are so easy to wear and to add pieces to. This floral duster is my favorite piece from this group of outfits. It’s gorgeous, and so light-weight, but it can also be worn over a thicker dress or some denim as well. Which of these looks would you rock? Are you loving floral print outfits right now too? I love that jumpsuit! I’d totally wear that!! These are such perfect flowy dresses and beautiful prints for summer! 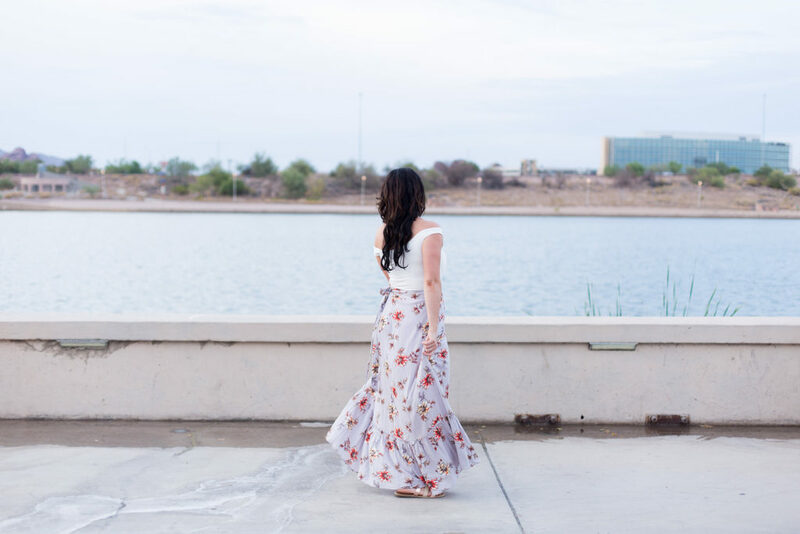 I love a nice maxi dress and that one looks so comfy! I love all of these outfits. Looks like it is time to do some shopping. I love these! Floral prints are my jam. They’re so much fun! Those are seriously gorgeous dresses! I don’t usually pull off summer dresses well although I wish I could. Alright, that’s it, we need to switch bodies. lol! Your mom body is SO much nicer than my mom body. Wow, that floral duster in the last outfit is so cute. Perfect as a transition piece for fall. These are awesome floral print looks. Great choices! The floral duster is just the coolest thing ever. You can pull off any outfit! Oh my goodness, Im loving the floral print, the jumpsuit and two-piece dress are calling my name! I love Floral anything! I am always looking for my next floral piece. These are great! I really love floral prints! So stylish and gorgeous! So many cute looks! I am in love with floral this summer, and there are so many cute designs. I definitely need to do some shopping. I am not big on prints because sometimes they look like curtains. However, I really love your choices. That first black and white print is awesome looking. What an awesome outfit and it really looks good on you. I am loving the floral print trend nowadays. It is just so cute and feminine. My husband even told me to go out and get some floral print blouses. I like the black jumpsuit in this post. So fashionable and perfect for the summer. You look amazing in every single one. I typically associate florals with spring, but you’re inspiring me to wear them all year round. Floral is great for summer. Love those outfits they look great on you. These outfits are so cute! I love floral prints in the the summer! You look great!